We have been using busy bags in our house from the time Mack was about 1. They are amazing for keeping kids busy in church, waiting rooms, airplanes, hotels, restaurants, etc. The general idea is that the activity is small enough to fit in a bag, doesn’t make a mess, and is quiet. I like to rotate them and keep a few different ones in my diaper bag at all times! I have heard of people doing busy bag swaps, where each participant makes busy bags for all of the children that will be at the swap, when you leave you will have a stash of busy bags for your child and you only had to make multiple sets of one bag. It sounds like a great idea to me! 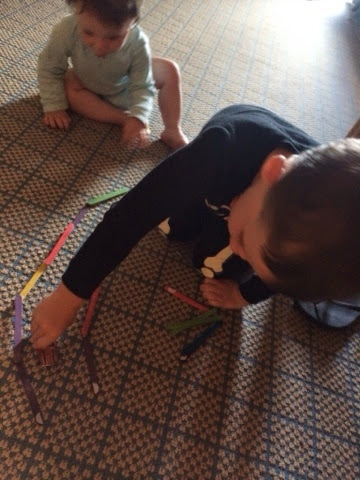 This is one of my favorites, Ava (11 months) can play with them by banging them together and exploring the velcro while Mack (3 years) can build a variety of things with them. 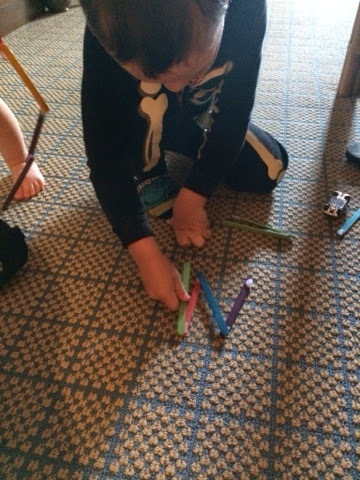 Start with Popsicle sticks, I found mine at the dollar store, they are th regular sized ones but the jumbo sized ones might be easier for little hands. You will also need some Velcro dots, if you are using regular sized sticks you will just need to cut the dots in half. The back of the dots should be sticky so you will just attach them to each end of the Popsicle stick. I do one side with the soft Velcro and one side with the hard Velcro but you could also make sticks that are entirely soft and others that are entirely hard. 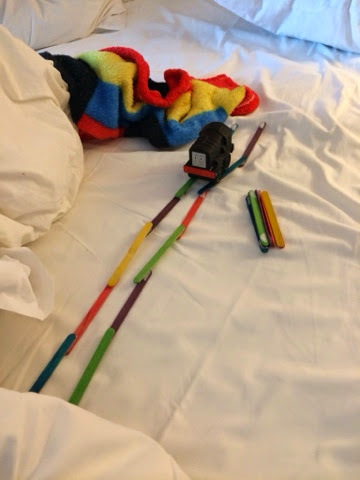 I like to keep these in a pencil case with some toy cars and trains because we always end up building tracks or roads with them. 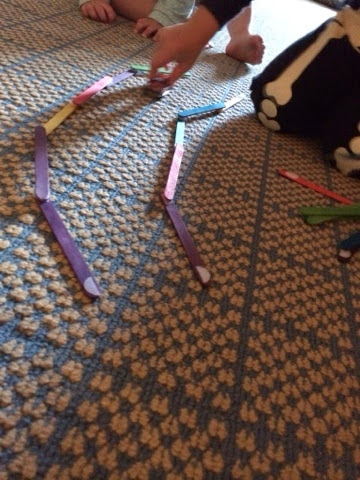 They are also great for making letters and shapes with! 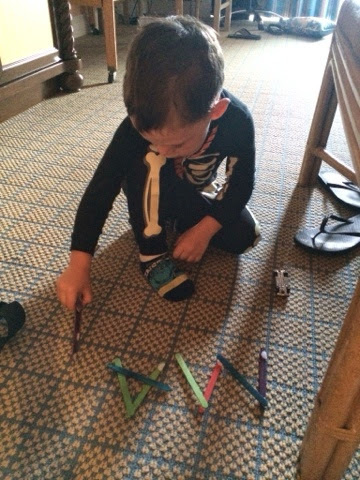 Mack loves spelling his name so this is a fun activity for him as well. We have also done the same thing with foam craft sticks. They are difficult to build with but great for making letters and bracelets/necklaces! Love your ideas Katie, and your simple instructions! I was never crafty but these ideas you have are awesome!